Interesting review. I used to use Reblog quite a lot, and the 'edit in place' feature you mention was really useful. After getting into the habit of editing/republishing snippets in Reblog, I found the 'share with comment' feature in Google Reader particularly annoying in comparison. 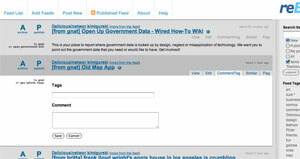 I guess this is the difference in UI decisions, between 'curating' and 'consuming' information. Almost all feed readers are focused towards consuming only. And yes, it would be great to see the recommendation/relevance features in Fever develop further, something that is still fairly underexplored in this space. However, I am slightly cynical that this will be able to work at all well in a general install, without a huge amount of specific tuning for personal preferences. A related problem is that a lot of people already have a 'hot' notification service, which goes by the name of Twitter. I can imagine not being able to avoid seeing a link being retweeted to hell and back, only to log in to Fever, to find, predictably, what has risen to the top. Even with a useful archive/hide feature, it will still be hard for Fever to beat Twitter as a medium for bubbling these links up (or 'echo chamber' if you prefer to see it that way). The way around this is to look deeper at the psychology of someone's reading habits and look at other aspects that might define a 'hot' link, rather than sticking with measures based on popularity and overlapping citations. It boils down to whether people want tools to see a realtime statistical/data crunch of popular memes and 'issue of the week' topics, or whether they want tools that recommend them new and interesting things to read (the former being much more evident than the latter). Sounds difficult, but I hope Shaun Inman does well with it. Clearly not reading this morning. That would be (http://en.wikipedia.org/wiki/Whack-a-mole ) syndrome. Mark, Twitter is kind of a weird bird. I keep hearing that it's replacing RSS reading for a lot of people, which is interesting. It seems like it's a shift in focus from primary sources to secondary, community sources. Nothing wrong with that, just an noteworthy change. 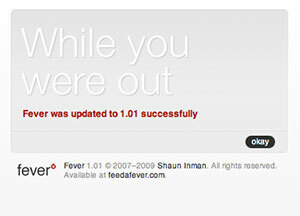 I haven't checked Fever out yet but after watching the screencast, my three initial thoughts were: 1. Like you said, beautiful. I hope young developers are inspired by Inman's impressive mix of design and programming skills. 2. The temperature text takes up waaaaaaay too much screen real estate. 3. I'm unsure if the recommendations are actually useful...most of it is stuff you'd see anyway. The really good links and information aren't always shared around in great numbers. A few good filters (like your snippets http://mike.teczno.com/snippets.html ) still beat recommendation engines or wisdom of crowds sites like Digg. Jason - thanks. =) I think the recommendations can be useful as a way to smartly avoid pile-ons. Unlike with Memeorandum there *is* a bottom, and it's worth being able to peel back a few layers to find it. Or would be, if this idea makes it into Fever. I'm really looking forward to whatever support forum or bug-tracking system that Shaun is setting up (he had mentioned it in an email a few weeks back). It'll be nice to know what's already been reported to him, and perhaps get a glimpse of upcoming features (if he chooses to share). I honestly don't use Fever for its purported strong suit, the Hot list. My experience with it so far is that there are too many "false positives," illustrated by the bazillion entries for Andy Baio's latest feed item: http://punkassjim.com/pics/IMG_0605.PNG http://punkassjim.com/pics/IMG_0606.PNG http://punkassjim.com/pics/IMG_0607.PNG This also happens a lot with Glenn Greenwald's posts, Andrew Sullivan's Daily Dish, and various others. So, yeah, the Hot list doesn't do me much good. Too much noise, not enough signal. What I really like is that I can specify, on a per-category or per-feed basis, whether the feed items are listed chronologically or reverse-chrono. So, for things like political news, I can thumb through the news in its proper order. Same with serial comics. But, for most link lists or "curator" feeds, I'd prefer to just see the latest first, and mark all as read when I get my fill. For me, this is why Fever rocks. Another excellent feature is the "unread most recently read" keyboard shortcut. The fact that it supports "multiple undo," and that you can perform these undo actions from a different device or computer than the one on which you did the reading? Man, that's just excellent. My biggest wish is that Shaun will write (or allow) a native app for iPhone. Or, failing that, at least modify his existing web app to use local database caching. Because, for those of us who do most of our reading on the train or subway, Fever's iPhone web app is currently all but useless. ...people who use strike-through as their visited link style, something normally used for things that, um, are stricken from the record, shouldn't gripe about others' UI choices. Just saying. I definitely agree with you about the "Hot" aspect of Fever. 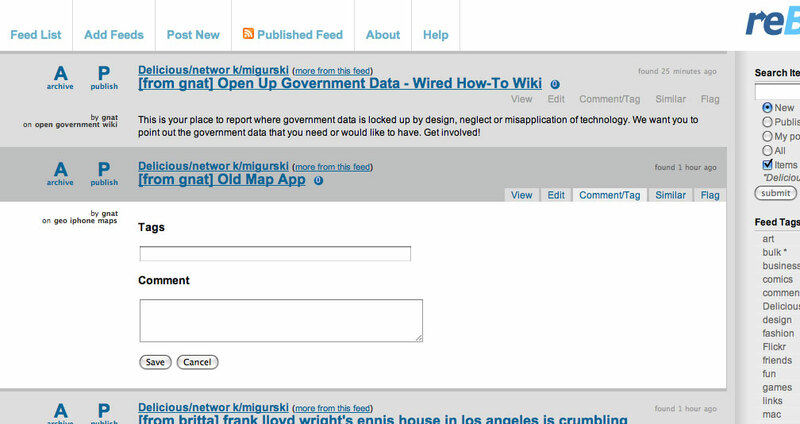 I was drawn in by the claims I saw around the internet that you can "create your own personalized digg." Of course I knew that probably wasn't exactly true, but what I got was the exact opposite. You're right, I want to look at the stuff in "Hot" exactly once. For a while I had the new Chrome OS at the top when I already knew all about it. I then tried to mark things as read and even started to debug using Firebug because I noticed each item has an onClick to set it as read. It was all very confusing. Since those first couple days I have not looked at the "Hot" tab once. 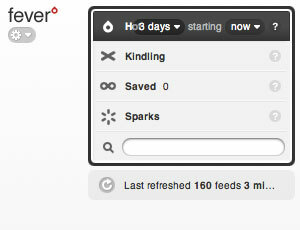 I just use Fever as a normal feed reader, browsing through the "Kindling" and practically ignoring the "Sparks." I hope there are some updates in the not-so-distant future, because as it is I am not too happy with my 30$ purchase. (I must admit it is much better than what I had been previously using, though: Google Reader widget on iGoogle. 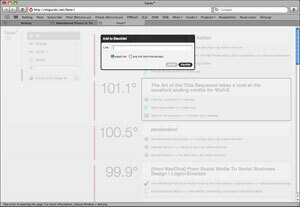 I just know that there is another web base reading tool such as Fever. I think I will give a shot for trying this apps as some part that I cannot find with others. Anyway, thank you for your review.